« Did Rancho Mission Viejo Allows Squatters to Register Sendero’s Internet Domain Name? As you may know, Orange County has a “General Plan” that describes its long-term goals for growth and development. The General Plan is comprehensive in that it covers seven core aspects of County life: land use, transportation, housing, conservation, open space, noise and safety. Today, we are going to look at the impact of the Ranch Plan on the recreational component of Orange County’s Master Plan. As our source document, we are referencing the Orange County General Plan’s Recreation Element, available here (large PDF download). Provide a useful, enjoyable, safe, and effi cient public regional riding and hiking trail system to meet the needs and desires of the citizens of the entire County. Create trail linkages between open space and recreation facilities, between community, municipal, state, and federal trail systems, and between the trail systems of surrounding counties. Provide efficient acquisition, development, operation, maintenance, and financing programs. Provide adequate funding and staffi ng for the development and maintenance of the regional trail system. Increase public awareness and support for the regional riding and hiking trail system through interpretive programs, exhibits, publications, and activities. You can see all current and proposed trails and bikeways on the OC Parks’ Master Planned Combination Map of Regional Trails and Bikeways (large PDF download). This map provides a general view of the County’s major trails and bikeways. We’ve enhanced and annotated the portion of the map that includes Ladera Ranch, Rancho Mission Viejo and portions of Coto de Caza and Talega in San Clemente in the graphic below (or you can access the full size version). Many new trail and bikeway linkages are proposed as part of the Ranch Plan. Most significant will be the completion of the San Juan Creek trail and bikeway from its current terminus at the point where San Juan Creek crossed beneath Ortega Highway just west of Antonio Parkway/La Pata. The new regional trail appears likely to run adjacent to the new fifteen acre community park at the corner of Ortega and Antonio (it’s noted as a proposed staging area on the map above, or see the community park directly on our map of Sendero), will likely pass underneath the Antonio Parkway bridge and will continue adjacent to San Juan Creek and the new Cow Camp Road all the way to where Ortega Highway again connects with Cow Camp at the entrance to Caspers Wilderness Park. The San Juan Creek trail is designated as both an unpaved riding/hiking trail and an off-road paved bikeway. We assume this means that the trail will be physically separate from the Ranch Plan roadways, meaning that it should pass underneath the new 241 extension and avoid any additional major north/south roads built as part of the Ranch Plan. If so, once this critical trail is completed, it should be possible to hike or bike from Sendero (or even Ladera Ranch) all the way to Caspers and even into the Cleveland National Forest without crossing a single major street! 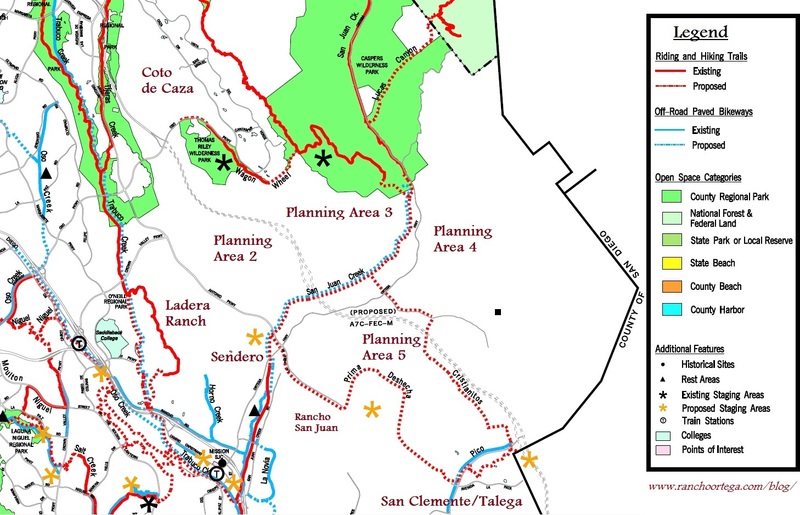 Note also the Wagon Wheel trail will be extended from Riley Wilderness Park through the southern tip of Coto de Caza and will also connect to the Caspers trail system. This is a non-paved hiking and riding trail, not a paved bikeway. You can also see new trails connecting Rancho Mission Viejo to the Talega development in San Clemente through Prima Deshecha (more on the future of Prima Deshecha’s landfill here) and along the Christianitos ranch road. The Ranch Plan Development Agreement requires that Rancho Mission Viejo Company complete many of these proposed hiking trails and bike paths as a condition to its development approvals. While the timing is speculative, and will depend in part on the phased build-out of the Ranch Plan development, it is encouraging and exciting to know that the Rancho Mission Viejo development will bring the public benefit of a robust and interconnected trail and bikeway system for residents of Ladera Ranch, Coto de Caza and Rancho Mission Viejo to collectively enjoy in the future.